In Just Words, John M. Conley and William M. O'Barr tackle the question of how an abstract entity exerts concrete power, focusing on what has become the central issue in law and language research: what language reveals about the nature of legal power. Each chapter covers a language-based approach to a different area of the law, from the cross-examinations of victims and witnesses to the inequities of divorce mediation. In this new edition, Conley and O'Barr add two new chapters. The first looks at the ways in which ideology is embodied in language, and the second examines the impact of linguists as expert witnesses. The authors have also added a new preface in which, from the vantage point of thirty years in the field, they lay out their vision of the next generation of law and language research. 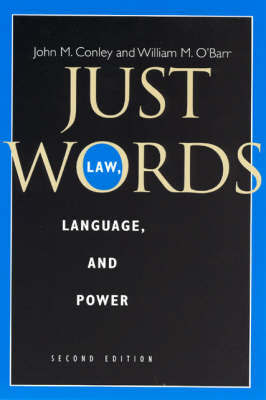 Combining careful analysis of common legal events with a broad range of scholarship on language and law, Just Words is an indispensable book for both students and scholars seeking to understand the reality of the power of language in everyday legal practice.